This morning I was visiting with some of the CCD classes, talking about the role of deacons in the parish. I explained to them that one of the things I do is taking communion to the sick at the Howard County General Hospital. I bring this up today because I will like to share something that happened to me a few weeks ago in one of these visits. That day I entered a room in which a group of nurses were attending to an older gentleman. I greeted him and waited quietly until they left to ask if he would like to receive the Eucharist. As it is my custom, after praying and giving him communion I spent some time in his room just talking. I asked him why he was in the hospital, how long had he been there, if he had any family or friends around and how was he feeling. The answer he gave to this last question left me speechless. With tears in his eyes he simply said: “How am I? I am well, now that I have Jesus in me”. I got to tell you my brothers and sisters in the two years I have been visiting the sick in this hospital I have never experienced such a display of faith and trust in the Lord. It was not what he said but how he said it that left me without anything to say; this man who a few minutes ago had a medical team hovering all over him because his high blood pressure, this man who was in serious risk of a stroke or a heart attack, revealed onto me the very image of hope, peace, and trust. That day I was reminded of a very important lesson: When we encounter Jesus, there is a big difference between been healed from our infirmities and been made well by this encounter. It all depends in our interior disposition and in how we see the Lord. Ten were healed, ten were made whole, and to ten sick men everything leprosy had taken away, their families, their friends, and their lives in the community were given back again. Only one returned to thank Jesus. 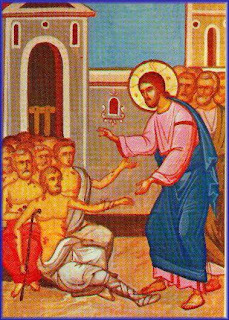 For only one of them the healing experienced was the cause of a transformation of the soul, and It is because of this transformation that Jesus exclaims "Stand up and go; your faith has saved you." It was not the healing power of Jesus who saved this man, but what he did with this gift of health. How this gift made him realize that more important than getting his life back was the returning to the Lord to thank him. This encounter with Jesus transformed him so that he was not just healed, he was made well. 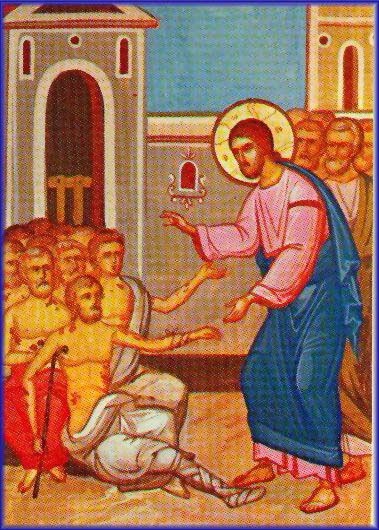 Like I said I visit many people in the hospital and I have seen the power and consolation the Eucharist brings to the sick. But what I saw a few weeks back, the encounter of a sick man with Jesus in the Eucharist, made me realize that more important than any miraculous healing we might think we need for us or for our loved one, been made well by God should be the goal of every Christian, a goal which can only be accomplished through an encounter with the resurrected Lord. The beauty of it all is that one does not need to be sick, or in a hospital for this encounter, Jesus is always calling on us to recognize him in those who surround us. And the best way to have this encounter is in the reception of the Eucharist. In this sacrament Jesus is present body, blood soul and divinity. By feeding us with his body and blood he unites with us, he becomes part of who we are; part of how we think and how we act. He opens the door for a deep encounter with us in every mass. When we truly recognize him in the sacrament of the altar we, like the leper in the gospel, would proclaim the Glory of God, and only then we would be able to say with certainty, “How can we be not well, when we have Jesus in us".